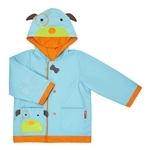 Outfit your little one for stormy weather in style with our new ZOO Raincoat. Whether you're headed to the bus stop or running errands, your toddler will be ready to head out into the rain. The colorful hooded visor and playful 3-D ears add a touch of whimsy, while keeping little ones dry. The adorable coordinating snaps are easy for tiny fingers to open and close, allowing your toddler to get dressed independently. Adjustable sleeves create the perfect fit for multiple seasons. Pair with the coordinating Zoobrella for a complete rainy day look. 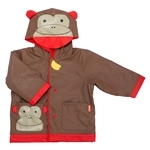 Outfit your little one for stormy weather in style with our new ZOO Raincoat. 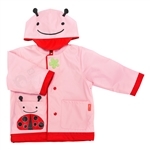 Whether you're headed to the bus stop or running errands, your toddler will be ready to head out into the rain. The colorful hooded visor and playful 3-D ears add a touch of whimsy, while keeping little ones dry. The adorable coordinating snaps are easy for tiny fingers to open and close, allowing your toddler to get dressed independently. Adjustable sleeves create the perfect fit for multiple seasons. Pair with the coordinating Zoobrella for a complete rainy day look. 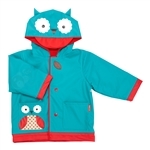 Outfit your little one for stormy weather in style with our new ZOO Raincoat. 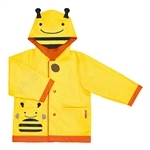 Whether you're headed to the bus stop or running errands, your toddler will be ready to head out into the rain. The colorful hooded visor and playful 3-D ears add a touch of whimsy, while keeping little ones dry. The adorable coordinating snaps are easy for tiny fingers to open and close, allowing your toddler to get dressed independently. Adjustable sleeves create the perfect fit for multiple seasons. Pair with the coordinating Zoobrella for a complete rainy day look.